This is a very simple configuration tool I made to save time browsing folders and adding values in Gconf, or writing commands in the terminal to customize certain aspects of the new Unity-2D Desktop. There’s not much to tweak under the current version of Unity-2D. However, there are certain times -Specially while I’m running Ubuntu on a VM- that I want to set the Launcher to be hidden or vice versa, and Compositing Manager makes it look way better (Near regular Unity) adding window edge shadows, transparency in the Dash and Alt-Tab Switching thumbnail previews. An updated version for 11.10 oneiric can be found in this post and for 12.04 Precise LTS in this post. Notes: If you click the compositing manager checkbox, hit “Alt+Tab” to refresh your desktop since by enabled-disabled you get a black screen. The ‘Always Show’ option for the launcher is tricky to set when it’s hidden (A native bug in Unity-2D caused by the ‘use-strut’ gconf key), you can use “Super” or “Alt+F2” keyboard shortcuts to bring the launcher back in position. # Visit <http://www.gnu.org/licenses/> for more information. nice! I like transparency option. Couldn’t make it work before. Everyone was saying that it works only in Unity 3d. Wow this is amazing and should really be included as part of Unity 2D. You should try and get in touch with those guys and talk about it being included. The compositing makes Unity 2D look sooo nice! This tool identifies the desktop environment in use, then disables what’s not compatible for the session. Example: If Unity (3D not 2D) is running, the “Shadows and Transparency” button goes grayed out since it’s not required using Compiz. Users who find problems trying to set Unity-2D’s preferences just make sure “Unity-2D” is the session shown at the bottom of your login screen (Not “Ubuntu”). Otherwise, it will not be customizable. You can check out bug 747343 at launchpad.net for more details. Thanks for this tool! Had to switch to 2D because the 3D made it impossible to play any video on my machine. Is there a way to hide the volumes from Unity 2D launcher? I hate that together they take one third of the space even on 1920×1080. 2.- Create a backup of this file by simply using “Save As” and store it into your preferred directory. This will help if you like to bring those icons back in the future. 3.- Now having the window selected, press Control F on your keyboard to launch the little search tool and type Component. You will get to the line 104 that reads Component.onCompleted All you have to do is delete the line that says “items.appendModel(devices);” , save changes, close the window and in the Terminal type killall unity-2d-launcher. Great tool! I am having a little problem, on my ubuntu 11.04 instalation (installed with “apt-get install unity-2d”). I can not see the changes made on the settings reflected immediately on unity-2d. I need to logout/login to see my options activated. The same think happens when I use gconftool-2. What might be the problem? Do I need to install anything else? Thanks for this great tool, really saves times ! I just installed unity 2d on Natty because Unity 3d is definitely a way too buggy as Ubuntu Classic session anyway, so the only option for me choose Ubuntu Classic(no effects), and of course in this mode impossible to use any docks, so direction to Unity-2d, and I must admit that it is more stable, lightweight and as great as Unity-3d, anyway I don’t have choice now. This tool is a god send! I have been looking for a way to keep the launcher from auto-hiding. Thank you for putting the work into this and posting it. I am curious what area this is modifying, and maybe I can modify those things myself, but otherwise this should hold me over until more settings are set up by the ubuntu team for the launcher. 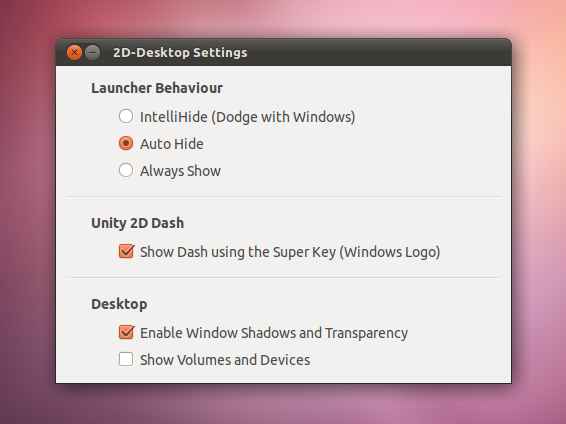 The settings for Unity-2D can be set using gconf-tool or gconf-editor at ‘/desktop/unity-2d/launcher’. Thank you and Thanks everyone for posting feedback about this tool. You should add a close button – it makes the program look nicer. The tool seems broken – I can no longer use this to make my launcher stay visible (and match maximized windows). Also, I can no longer go into unity settings in gconf-editor/dconf-editor to get the same effect. Using the daily builds here, which is probably why. Thank you so much for this tool. It makes Unity a viable option for me. I had a problem with this tool to make the launcher auto-hide (it stayed visible and my windows didn’t adjust accordingly). The problem was that the launcher options were disabled, with dodge windows checked. To fix the problem I went to gconf-editor –> /desktop/unity-2d/launcher. Here I found the hide_mode key was ‘missing’. Finally I decided to just add this key (right-click) with the (integer) value 2. This did the trick for me! Thank you for putting me on the right track. This is great since I don’t need to grab a pot holder or towel to open the lid. A crock pot that can be removed from the heating element (or base) is helpful for browning meats. cup of organic beef juice (grease-extracted), preferably left-over from cooking a roast or prime rib.